The PE9309 is a high-performance dynamic UltraCMOS® prescaler with a fixed divide ratio of 4. Its operating frequency range is 3.0 GHz to 13.5 GHz. 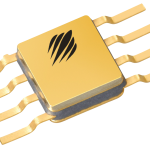 The PE9309 operates on a single supply with a frequency-selecting bias resistor and draws only 16 mA. It is packaged in a small 8-lead CFP and is also available in DIE form for hybrid application. Typical industries include medical, automotive, telecom, infrastructure, test instrumentation, down-hole oil/gas and military. Screening is available for commercial space applications.